On Friday, 6th September, the Reverend John Ardis was instituted by the Bishop to the incumbency of Abbeystrewry Union in the United Dioceses of Cork, Cloyne and Ross. Abbeystrewry Union is centred on the town of Skibbereen and encompasses its surrounding area, including the coastal villages of Baltimore and Castletownshend, as well as the inland village of Caheragh. 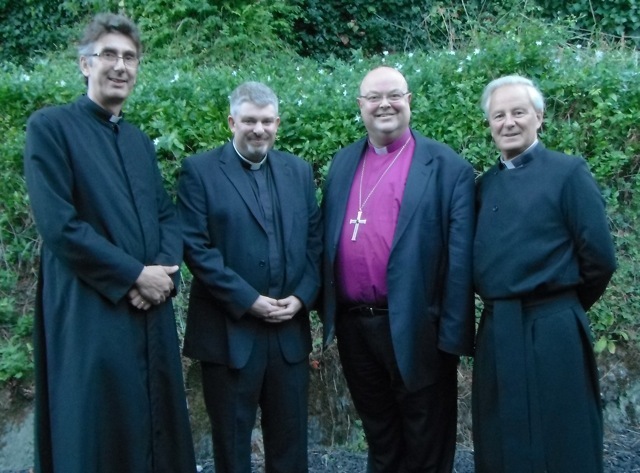 At the Institution of the new Rector of Abbeystrewry Union (l-r) the Very Reverend Nigel Dunne, Dean of Cork (preacher at the Service); the new rector, the Reverend John Ardis; the Right Reverend Dr Paul Colton, Bishop; and the Reverend Trevor Lester, Rural Dean of West Cork. This entry was posted in Appointments, Church of Ireland, Church Services, Clergy, Diocese, Installations, Parish News. Bookmark the permalink.